Manufacturer of a wide range of products which include laminated copper flexible and tinned bare copper braided. We have achieved a distinct position in the market by providing Laminated Copper Flexible. These connectors are made up of high-grade basic material like aluminum, optical fiber wires, copper, etc material and contemporary tools under the supervision of skilled technocrats. The offered connectors are widely applicable for industrial and commercial sectors for providing a reliable connection between two parts. 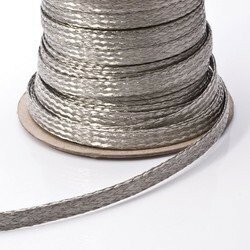 We are recognized as the leading manufacturer, marketer, and supplier of supreme quality Tinned Bare Copper Braided. These flats are extensively used for shielding of cables, protective braid over the tubing, ground straps and other applications. Our offered flats are fabricated using high-quality raw material and innovative technology. Further, our flats are tested with all quality standard parameters, as per the set industry norms. Due to their salient features, these are highly demanded and available at nominal prices.